AMCC will present its third Corporate Social Responsibility (CSR) to Saffron Road and its first entrepreneurship award to Ahmad Adam, CEO of Crescent Foods at the upcoming 4th American Muslim Consumer Conference. The conference will be held at the DoubleTree by Hilton Hotel, Newark Airport, New Jersey on Saturday, November 17th, 2012. http://americanmuslimconsumer.com. The American Muslim Consumer Conference (AMCC) has played an integral role since its start in 2008 to raise public awareness for the American Muslim market. There are close to seven million Muslims living in the America and they make up an estimated 170 billion dollar market that is largely untapped. AMCC will give this year’s Multicultural Award, which promotes diversity in America, to Saffron Road. The Saffron Road brand is making a major impact in addressing unmet consumer needs in the multicultural market by bringing food from different ethnic backgrounds to major retail outlets such as Whole Foods. Their focus has been to reach out to customers beyond the Muslim / halal food market and address the needs of any consumer looking for healthy, organic, antibiotic free and humane alternatives. They also have a wide selection of gluten free products. Their Ramadan campaign in 2011 was very successful and neutralized the media backlash related to Muslims and Islam in America into a positive spin focusing on diversity and tolerance. This marketing strategy can be used as a case study for many companies facing similar issues and challenges to make their products and services more mainstream in America. 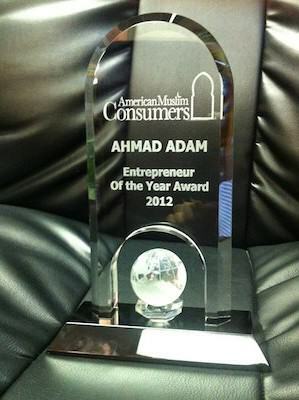 This year, to recognize entrepreneurs whose contributions are making a major impact in addressing the American Muslims, AMCC will be will be launching a new award called the “Entrepreneur of the Year” Award. This award will be given to Ahmad Adam, CEO of Crescent Halal Food to highlight the leadership he has provided in the halal food industry and implementing Islamic principles in financial, social and ethical areas involving Crescent Halal Food. From its Chicago based facility, Crescent is supplying halal food to major food chains which include over 70 Walmart locations, which has established its position as a leading supplier of halal food in America. This year’s conference key note speaker will be TED speaker Dr. Naif Al-Mutawa. Dr. Al-Mutawa is the Founder and CEO of Teshkeel Media Group and created THE 99, the first group of comic superheroes with an Islamic background. President Obama praised this as the most innovative initiative viewed by his Presidential Summit on Entrepreneurship and Forbes identified THE 99 one of the top 20 trends around on the globe. To receive more information on the 4th Annual American Muslim Consumer Conference, please visit http://americanmuslimconsumer.com. The American Muslim Consumer Conference is the only platform for industry professionals to explore the rich potential of the American Muslim market. This year’s conference is themed “The New Face of Muslim Consumers: Socially Conscious, Innovative and Engaged“ and will be held on November 17th, 2012 at the DoubleTree by Hilton Hotel, Newark Airport, NJ. Last year’s conference was titled “Multiculturalism & the American Muslim Consumer Market” and drew a crowd of over 350 participants.